It’s another momentous day in the history of space exploration: the China National Space Administration (CNSA) has reportedly just landed its Chang’e-4 rover on the far side of the Moon, marking the first time we’ve been able to explore this hidden side of the lunar surface. Not only that, the rover has already sent back its first image, and it’s absolutely breathtaking. With the Moon tidally locked with Earth – taking the same amount of time to spin round on its axis as it does to orbit our planet – one half of it is always hidden from view. Now, we should be able to get a detailed look at it. As we’ve previously reported, the Chang’e-4 lander will relay messages via the Queqiao satellite, which is now sitting in orbit around the Moon. As Chang’e-4 will never be in a direct line of sight with Earth, that satellite relay is going to be essential. And the new exploratory probe could return a whole host of valuable data: examining the geological make-up of the surface around the South Pole-Aitken basin, a part of the Moon we currently know very little about. It’s thought that the basin was created by a huge collision early in the Moon’s history – which means materials from lower down in the Moon’s mantle that we haven’t been able to get to yet could be exposed in this region. And the more we know about the Moon, the more we can figure out about the history of our planet and our Solar System. The lander should also be able to make some useful observations of deep space, without Earth getting in the way. China Daily reports that the lunar probe touched down at 10.26am Beijing local time on Thursday the 3rd of January, arriving in the Von Kármán crater (named after Theodore von Kármán, the advisor to the founder of the Chinese space program, Qian Xuesen). The journey from Earth started on the 8th of December but of course the project as a whole has been years in the making. We’ve known for a long time about the CNSA’s ambitions to get a probe landed on the far side of the Moon – and it has now made good on its promise. 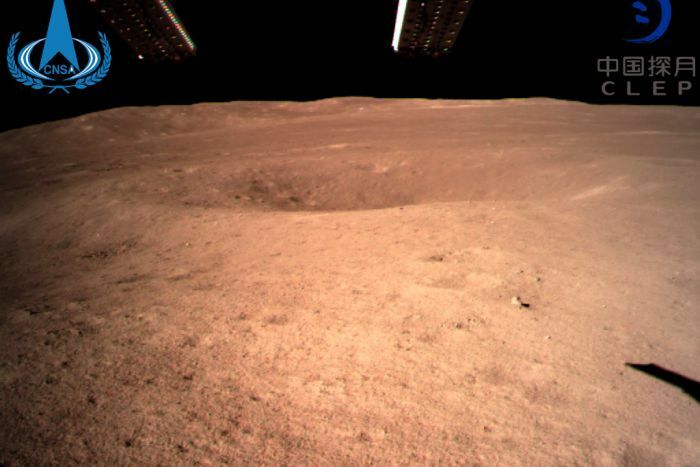 Check out this Twitter thread from the China Global Television Network for some awesome shots taken as the Chang’e-4 lander touched down on the far side of the Moon. As yet no hidden alien civilisations have been discovered – but it’s early days. While spacecraft have been able to take photographs of the far side of the Moon before, this is the first time we’ve ever managed to successfully land something on the surface: NASA’s Ranger 4 probe touched down in 1962, but ended up malfunctioning and didn’t send any data back. We’re looking forward to the treasure trove of data Chang’e-4 sends back, but the CNSA aren’t stopping here – Chang’e-5 is scheduled to launch by 2020, with the aim of landing on the Moon and then returning to Earth.